Where were you in 1978? I was a teenager in 1978 – buying lollies at the local corner shop! 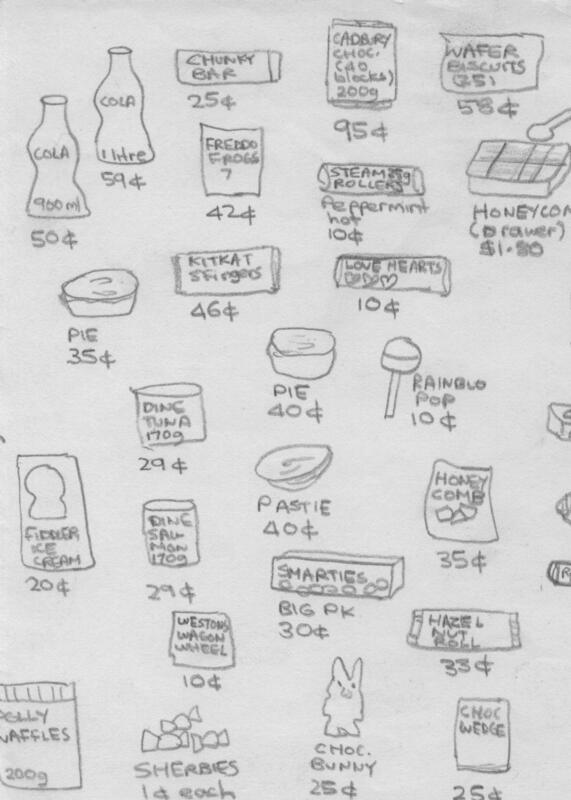 As one of my interests at the time was drawing and as I have an eye for detail and a penchant for paying attention to marvellous things like how much lollies cost, I took it upon myself to sketch a range of lollies and their prices, back in 1978! The prices are in Australian cents. Since 34 years ago, the prices have changed now, for example a 200g block of chocolate now costs about $5 instead of 95 cents. Of course, back in 1978, the 1 cent lollies, or better still, lollies at two for 1 cent were highly favoured. Nowadays, you have to spend $1 at the Deli for a small bag of sweets! I love my sweets. 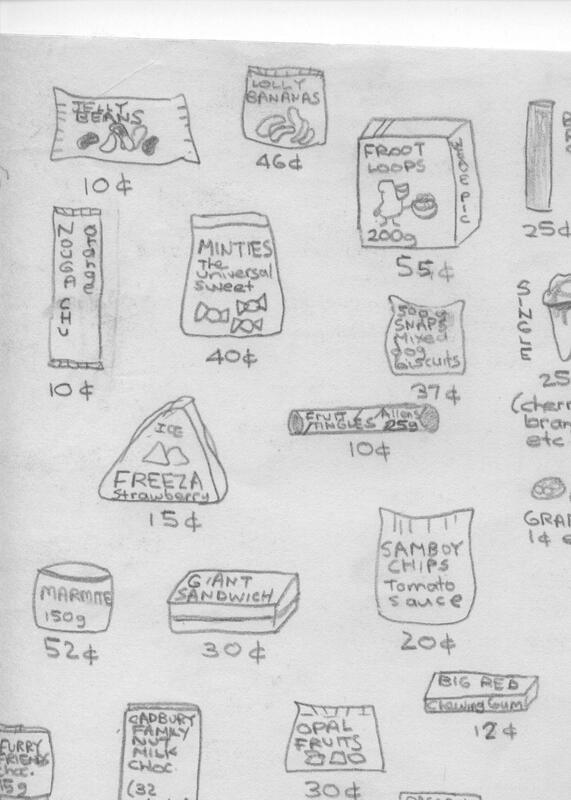 You can see I liked some savouries too, from my drawings (namely pies). My favourite sweets were Rain Blo Pops and candy Myrtle the Turtles. I can still remember the day when the price of Myrtle the Turtles went up from 5 cents to 10 cents, a worrisome development to us kids. Strange that the Turtle shaped candies don’t appear in my sketches. Perhaps I couldn’t bear to put them in, knowing they would become extinct, or maybe I just couldn’t draw Turtles. Great Britain is famous for its delicious chocolate bars (as my British born partner likes to tell me), and sadly, Australia, having such a hot and dry climate is not abounding with wonderful treats like Yorkies and Galaxies. Sweets tend to gravitate toward me too. I have won substantial prizes of sweets. I won a whole shop sized carton of Wobbly chocolate bars once in a random competition. These chocolate bars are not available now but were a bit like Curly-Wurlies, in beautiful sparkling pink packaging. I excitedly took the whole box to work and shouted “I’m throwing Wobblies” and tossed chocolate bars for all onto the table (and this is a true story). Last year, I won a glass canister filled with over 800 M&Ms because I cleverly guessed the right number of chocolate M&Ms in the jar ! Sweets were really invented in the 19th century. However people have always liked eating sweet food. The earliest sweet was, of course honey, which people have eaten since prehistoric times. (Until the 19th century sugar was a luxury and few people could afford it). In the Middle Ages rich people ate desserts like preserved fruits, jelly and dried fruit and wafers made from batter. The Tudors were also fond of sweet foods (if they could afford them), which they called sweetmeats. The rich ate preserved fruit, gingerbread, sugared almonds and jelly. Marzipan was introduced into England in the late Middle Ages. It is a paste made of almonds and sugar. The Tudors used marzipan to make edible sculptures of animals, castles, trees and people called subtleties. Furthermore people have eaten barley sugar since the 17th century. In the late 17th century the rich began eating ice cream. Many rich people built special underground chambers in the grounds of their houses for preserving ice during the summer. The ice was covered in straw to preserve it. Then in the late 18th century people began to eat macaroons. Furthermore the French have made nougat since the 17th century and caramel was known in England by the 18th century. However before the Industrial Revolution confectionery was hand made and so was very expensive. In the 19th century people first began to eat sweets in their modern form. Potato crisps were invented in 1853 and Kendal mint cake was invented in 1869. Turkish delight was invented in 1777 and it became popular in Europe in the 19th century. Meanwhile as sugar became cheaper during the 19th century new boiled sweets were developed. Other new sweets invented during the 19th century included peanut brittle (1890), candy floss (1897) and liquorice allsorts (1899) (liquorice was originally used as a medicine but Pontefract cakes were invented in the early 17th century and people began to eat it as a sweet). Chocolate came from Central America. The Spaniards brought it to Europe in the 16th century and it reached England in the 17th century. However at first chocolate was drunk not eaten. The first chocolate bar was made in 1847. Milk chocolate was invented in 1875. Furthermore the first chocolate Easter eggs were made in the 1800s. New sweets were invented in Victorian times. Modern marshmallows were invented about 1850. Toffee was also invented in the 19th century (the exact date is not known) and fudge was invented in the USA in the 1880s. Moreover people have chewed gum from trees for centuries but chewing gum was first made commercially in 1848. Jelly babies were invented in 1864 and wine gums were first sold in 1893. Furthermore seaside rock was invented in the late 19th century. In 1903 the ice cream cone was invented. Choc-ices went on sale in the USA in 1921. Meanwhile bubble gum was invented in 1906 (although it wasn’t actually sold until 1928) and the first lollipops were sold about 1908. In 1922 ice cream was sold in the street for the first time from tricylces with a box on front. Sales of ice cream boomed in the 1930s. Also in the early 20th century manufacturers began to use peppermint to flavour sweets. They also added sherbet to sweets. Many new kinds of sweets were introduced in the 20th century. Dairy Milk was introduced in 1905. Toblerone followed it in 1908. Later came Flake (1920), Fruit and Nut (1921), Milky Way (1923 in the USA 1935 in Britain), Crunchie (1929), Snickers and Freddo (1930), Mars Bar (1932), Whole Nut (1933), Aero and Kit Kat (1935), Maltesers and Blue Riband (1936) and Smarties, Rolo and Milky Bar (1937). Later came Polo mints (1948), Bounty (1951), Munchies (1957), Picnic and Galaxy (1958), Caramac (1959), Topic (1962) Toffee Crisp (1963), Twix (1967), Curly wurly (1971), Yorkie, Double Decker and Lion Bar (1976) and Wispa (1983). Amazin Raisin bars went on sale in 1971 but they stopped making them in 1978. Meanwhile jelly babies were invented in 1918 and the ice-lolly was invented in 1923. Black Jacks have been sold since the 1920s. Lovehearts were first made in 1933. Starburst was invented in 1960 and Spangles were sold from 1948 to 1984. Chewits were introduced in 1965. Skittles were first made in 1974. Walnut Whip was first sold in 1910. Furthermore boxes of chocolates were introduced. Milk Tray dates from 1915. Terry’s Chocolate Orange and All Gold were introduced in 1932. Black Magic was introduced in 1933. Dairy Box and Quality Street came in 1936. Cadbury’s Roses date from 1938. After Eight dates from 1962. The first ready salted crisps were sold in 1960. Flavoured crisps followed in 1962. In Britain sweets and chocolate were rationed from 1942 to 1953. 5 February 1953 was a day of rejoicing for children! You can see Marmite in the sketches, a relation of the famous “Vegemite” of Australia, which many non-Australians hate. A “cousin” if you like, of Vegemite, is, of course Peanut Butter. I have always loved Peanut Butter, while strangely, my twin sister has always loved Vegemite. 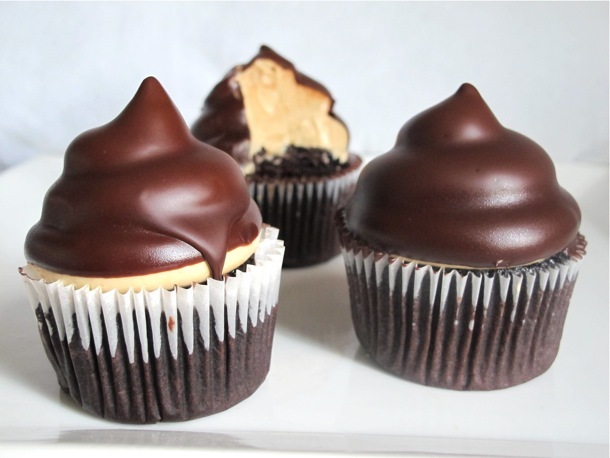 The delicious cakes above are Peanut Butter Chocolate Cakes, and you can find the Recipe to make them, by clicking here – enjoy !! Categories: Cakes, Food, History, Sweets | Tags: cakes, chocolate bars, food, History, history of sweets, lollies, marmite, peanut butter, prices of lollies in Australia.1978, sweets | Permalink.